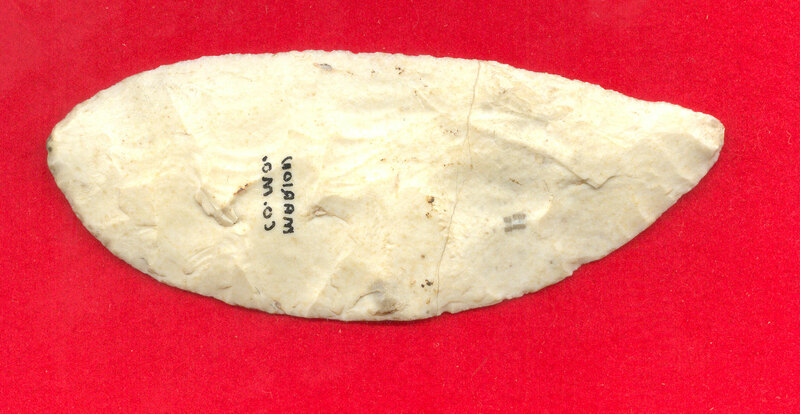 A Large Size, Thin, Nicely Flaked, Aged And Visibly Anciently Used And Blade Edge Sharpened, Archaic Knife That Exhibits Surface Sheen And Stone Coloration Patination, Correct Early Style Blade Edge Flaking, Aged Surface Deposits, Visible Blade Edge Aged Use Wear, Visible Blade Edge Holding Dulling, Correct Type Material And Manufacture For The Area Found. Ex-Lewis McDaniel Collection. This Is A Hand Held Knife Due To Hand Protection Edge Dulling And Possibly A Late Paleo Period Knife Due To Shape And Blade Edge Flaking! Includes Dwain Rogers And Ken Partain Certificates of Authenticity!